Today was butcher day! Well, really butcher morning. 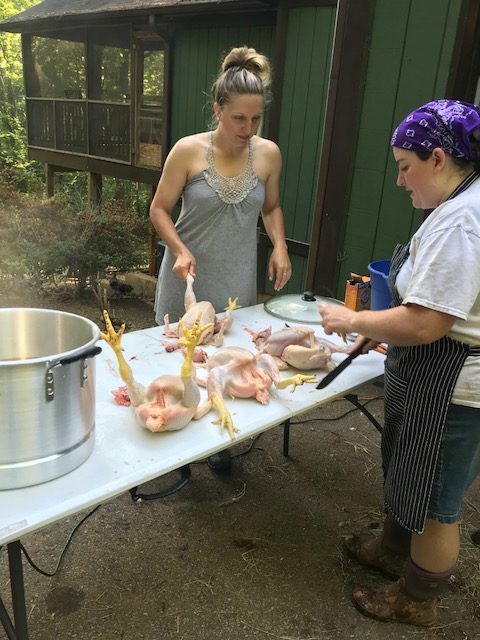 We decided to go ahead and dispatch and process the meat birds today, at just over 8 weeks old. 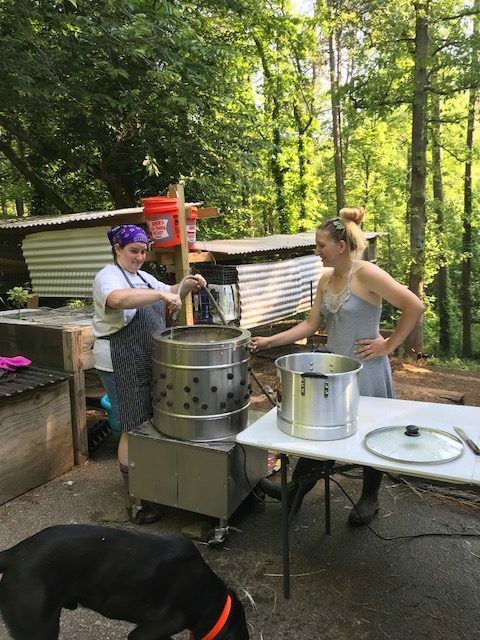 My friend Sandra Walker (she led our soap making workshop) brought over her chicken plucker and graciously offered her assistance with the process. 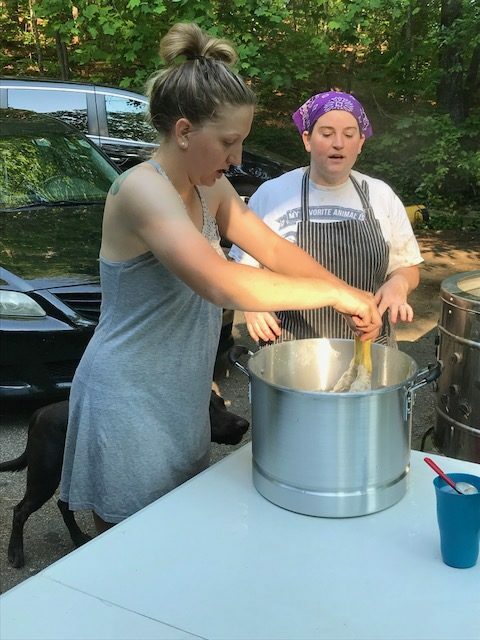 She has processed MANY birds for her family as well for retail sale, so I was very glad to have her guidance throughout the process. We started around 08:30 and were finished by 10:00. Not too bad for two people (although Justus did the odd jobs we needed him to, like getting more hot water, salting the ice water, etc.) doing 11 birds! 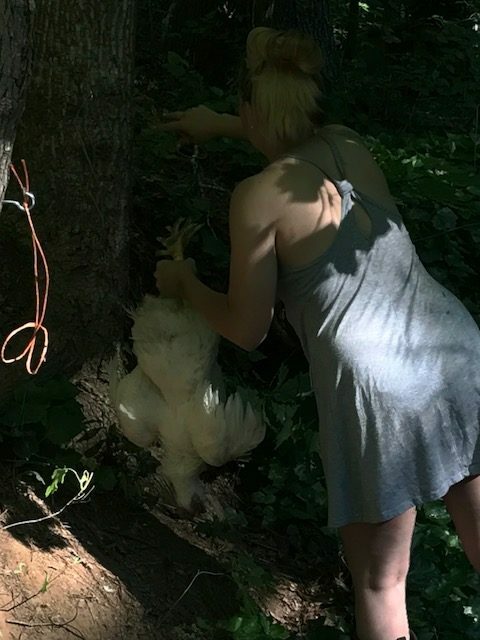 It was somewhat bitter sweet, grabbing the first 4 birds and dispatching them, however once they were bled, plucked, & eviscerated, they looked lovely and were hardly recognizable as their living, bowling-ball type selves. The whole process for the birds was painless and as stress free as possible for them. Sandra has a fabulous butcher apron and I will totally be buying myself one. 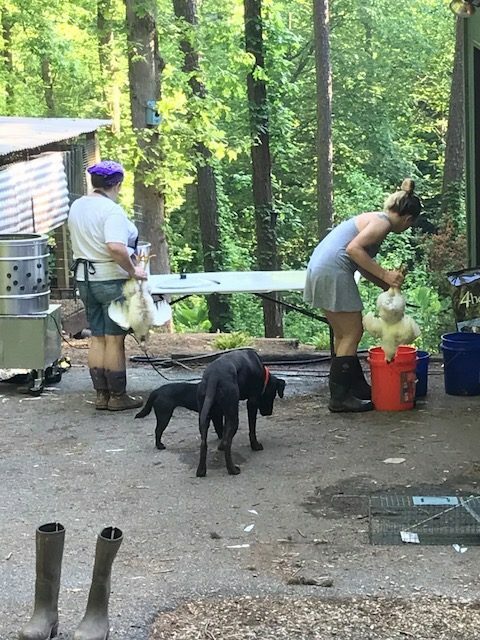 We worked in batches of 4 birds – first dispatching (via cutting their throats and bleeding them out upside down), then plucking all 4 at once in the plucker, then cleaning & evisceration, & finally ice bath. I would say it took us about a half hour per set of 4, about 15 minutes total per person per bird – not too shabby. I purchased some shrink bags and “official” labels so that if I decide to sell any to anyone, the safe handling instructions are included on the bird. Our final total cost came out to $81, or $6.75/bird (increased to $7.36 since we only were able to butcher 11). 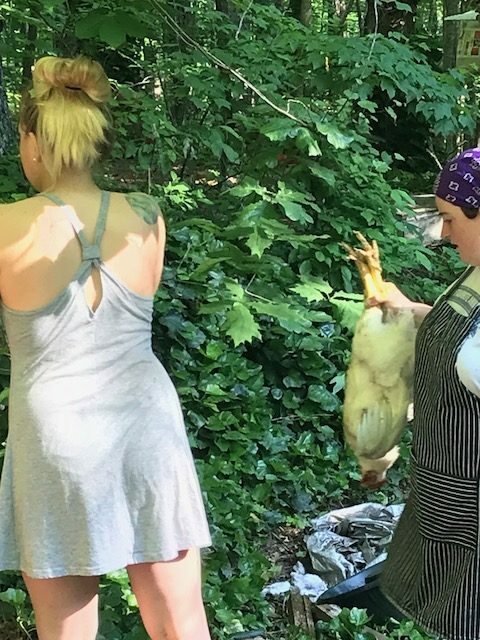 The average weight of the chickens was 4.74 lb (4lb 11.9oz), with the largest bird weighing 5.46 lb (5lb 7.4oz) & the smallest weighing 4.01 lb (4lb 0.2oz). This brings our price per lb (to break even) out to $0.64/lb. 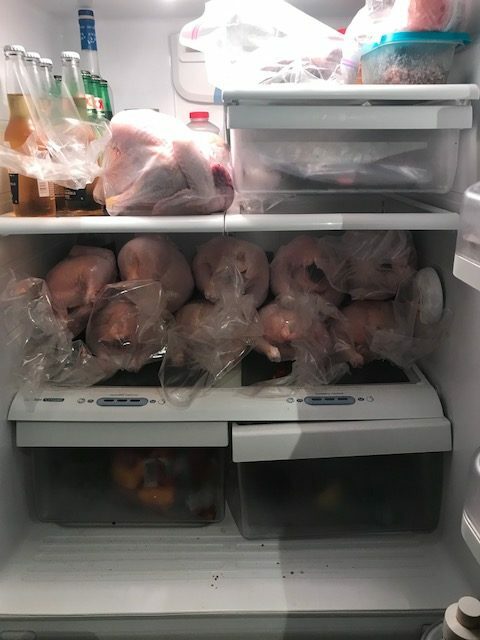 We have just over 52lb of meat from today, and I am beyond thankful. 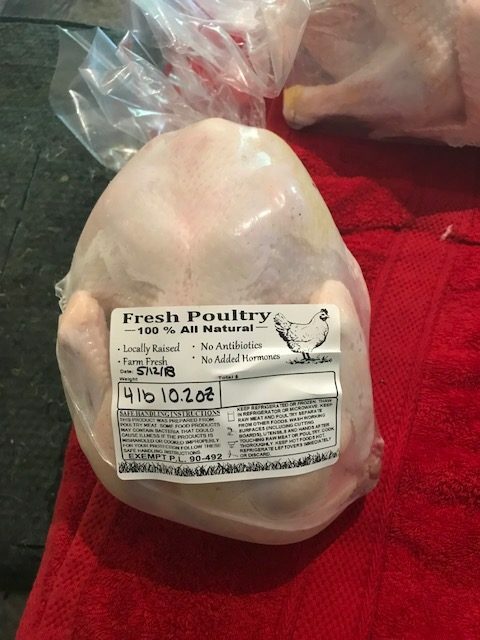 We’ve decided to sell any extra birds for $4.25/lb, averaging around $20 per bird for humanely raised & dispatched, pasture-raised, [organic] chicken. I am thinking I have to make a trip your way!